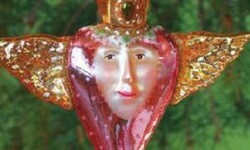 Handmade glass Made in Poland Holiday ornaments is Patience Brewster's work for 2012/ 2013. Extensive collaboration with glass blowers brings out her unique details for painting. For the past few months Patience Brewster has worked with glass blowers in Poland to create a new totally glass ornament. Special molds the blower works with were created to shape details that traditional methods will not allow. After the glass shape is completed the inside is coated with silver and then the painting details can be done, with special bright glass paints. Each piece is very special. They are of substantial size with most measuring six inches high. Patience Brewster Violetta Pig Glass Ornament Made entirely by hand! Each piece is an individual work of art! Dimensions 4" x 4.5"
Glass ornaments are mouth blown and hand painted in Poland! Measures 6" x 3"
Patience Brewster Purple Party Hat Cat Glass Ornament Made entirely by hand! Each piece is an individual work of art! Dimensions 6.5" x 3"
Patience Brewster Partridge With Pear Glass Ornament Made entirely by hand! Each piece is an individual work of art! Dimensions 6" x 3"
Do you like Patience Brewster's very distinctive designs? Yes, I enjoy her designs. No, I like less quirky design elements. This year I did some extra searching and found Sears offers the Polish ornaments online. This is a good choice for those in the points program at Sears. Your PB purchase will give you point earnings. If you are looking for the designer's other issues, like the newly designed resin, and table top Reindeer sets including Santa, Twelve Days of Christmas Piper set and mini ornament set, Sears, the old department store from another century, has over a hundred Brewster items at very good prices. Even view some old Department 56 PB items. You get points for each of your purchases. See all one hundred+ items. at Sears. In the video Patience gives all the details and shows the many steps going into the making of the new Polish glass ornaments, including the firing, dipping in silver nitrate, and hand painting of each individual piece. She enjoyed picking the many colors of glass paints. Glitter and iridescent colors are used on some styles. New Ornaments First Made in 2012. The new Polish ornaments were first packaged and offered in 2012. Note the model or product ID is 08-307XX or 08307XX. Two new styles for 2013 are model numbers 08-30852 and 08-30851 for a red heart and a Santa. Model numbers are very important for those of you who need pieces made in a particular year. Older glass would have different ID's and are not the new designs Made in Poland. The Brewster family interfaced personally with artists in Poland to produce the all new designs. Working with the artists one on one is a new direction she decided to peruse herself a few years ago. Attention to detail, researching and artist collaboration will make your collection a family heirloom. A fun 21st century example of the designs prevalent in our times for the family to admire in the years to come. paperfacets, The high heel ornament charmingly conjures up Cinderella and the Old Woman in the Shoe. Have you seen Dale Chihuly's videoed collaboration with a glass blower and a glass sculptor from Murano in northeast Italy's Veneto? I have some nice ornaments, but I've never seen hers. They are really lovely and very unique. Wonderful colors. I see you're in La Verne. I lived there for several years. Good people there. I do like the Patience Brewster items - they are very unique. I hadn't seen these glass blown ornaments before I read your page.